A casting director and a 7-foot tall Nigerian walk into a bar...it sounds like the start of a joke, but it actually resulted in horror movie history. That good looking young man you see above is inadvertently responsible for giving us nightmares. 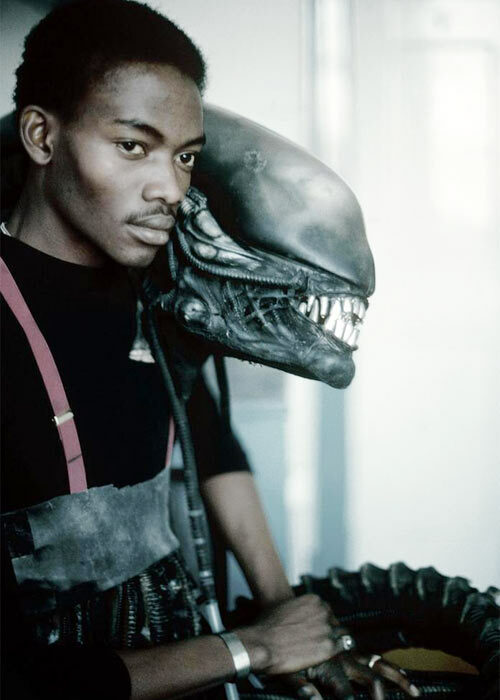 Bolaji Badejo was a 26 year-old graphic design student having a drink in a London pub in 1978 when he was spotted by a casting agent working with Ridley Scott on the movie Alien. They had yet to find an actor suitable for the actual role of the creature who would terrorize the crew of the ship Nostromo. 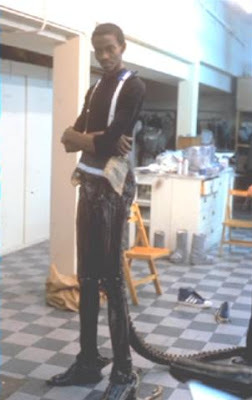 They needed someone tall and gangly as Scott didn't want audiences to think there could possibly be a human in the costume. He'd been considering basketball players and Peter Mayhew, who played Chewbacca in the Star Wars trilogy, when Badejo was brought to his attention. At 7 feet tall with a sinewy frame and long legs and arms, the Nigeria-born Badejo looked like he'd be a fit for the gig, and he accepted the role. 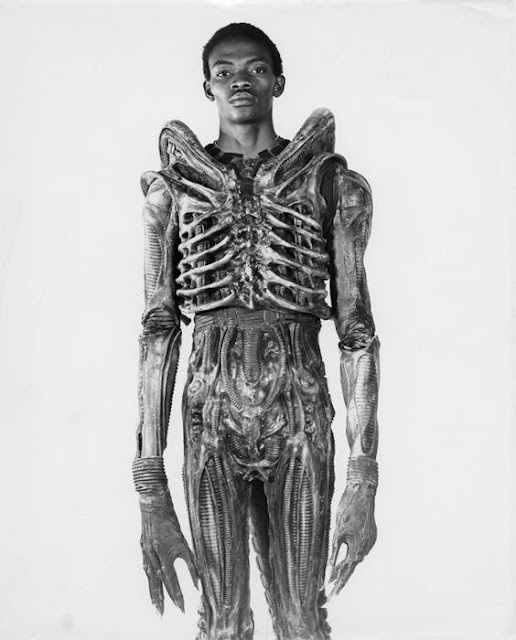 The costume itself, designed by H. R. Giger, was made out of 10-15 latex pieces that were custom fit to Badejo's body after he put on a one-piece black bodysuit. The tail attached separately and was controlled with wires. The worst part of it, I'm sure, had to be the gargantuan alien head, which Badejo said was like wearing a huge banana. The suit itself was very hot and Badejo recalled that it didn't take long for him to get soaked with sweat, especially the head. Ridley Scott was also full of ideas for the alien and tried filming several scenarios which just weren't possible because of the logistics of the costume; in one scene, the alien was supposed to be curled up like a cocoon in the air and slowly unfurl itself, but Badejo found it impossible to breathe, let alone move. He also had to deal with a never-ending supply of K-Y jelly which created the acid saliva secreted by the alien's mouth. I think the best part about reading this interview is how scared the other cast members were of Badejo in costume on the set, especially poor Veronica Cartwright, who was also squirted unexpectedly with blood during the chest burster scene. The story takes a sad turn, however. Apparently Bodejo fell off the map after the Alien movie was released. According to the interview, he was excited about a potential movie career and legally contracted to appear in a sequel, and there have even been rumors on the Internet that he died, even though there's no proof. If anyone out there knows what happened to Bodejo, I would love to know. Here's a behind the scenes clip of Bodejo getting used to the costume and the alien's movements on the cramped set. Kudos to a guy who didn't get a lot of credit for bringing an unforgettable movie monster to life. An incredible post. Posting this to my Facebook right now! 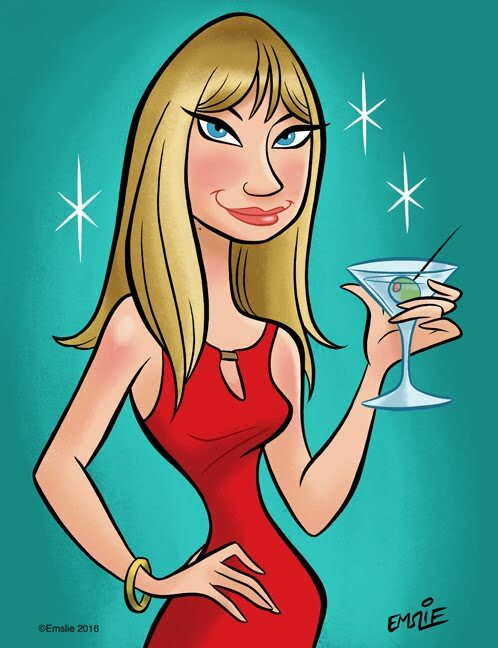 Thanks for sharing, Desiree! How have you been? All crap I'm afraid. I'm the grandson of eddie Powell, the stuntman drafted in to originally do the stunt sequences but when Bolaji failed to be able to move in the suit do to his lack of strength, my grandfather took over all of it. Even discussing the credit it for it at the end, which the never gave him. Bolaji went to ground when he was caught giving interviews that were false and cashing in on them. He then promptly disappeared and took all the credit with him. I furiating as eddies family as we'd like everyone to know this.... however have you ever tried taking on the while internet when it's wrong lol. Thank you for your comment. I would love to update this post so your grandfather gets the proper credit. I'd be curious to know if on the final cut of the movie that was released, if your grandfather was the one on screen for the entire time in the suit or if they used footage of him and Bolaji?